I read several reviews from reputable (The New York Times, The Atlantic) resources before writing my this review. 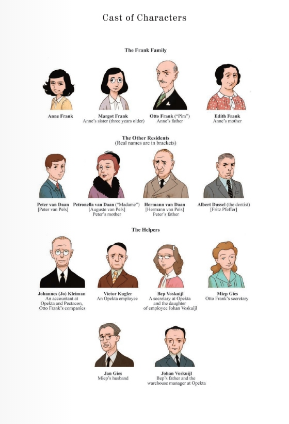 It's impossible not to recognize the import of adapting this iconic work, and I knew that I would be immediately drawn in by Anne's words and the accompanying images and lose my ability to be critical of the choices made by Folman and Polonsky, who were commissioned by the Anne Frank Fonds, inheritor of the estate of Anne Frank, to "write and direct an animated film for children based on Anne's diary, as well as edit the diary into a graphic adaptation." And, having the perspective of others more knowledgeable and informed than me, I have decided to focus my review of the graphic novel adaptation of Anne Frank's Diary on its value in an educational setting, specifically an elementary school. 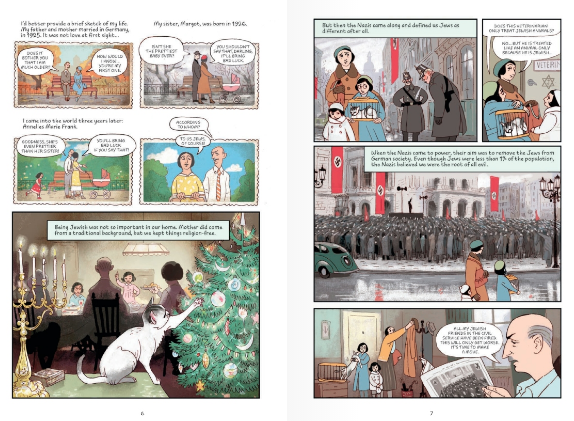 From my decades as a children's bookseller, and now as a school librarian, I know that kids become interested in the Holocaust (and the horrible things humans have done and continue to do to each other in general) by middle school, often more around fourth or fifth grade. And I happen to have a fourth grade student at that point right now. I have given her every work of historical fiction on my shelves set during WWII and the biographies on Ann Frank that I have and she wants more. She is also Latinx, the daughter of immigrants and she doesn't have much of a foundational understanding of American and world history. 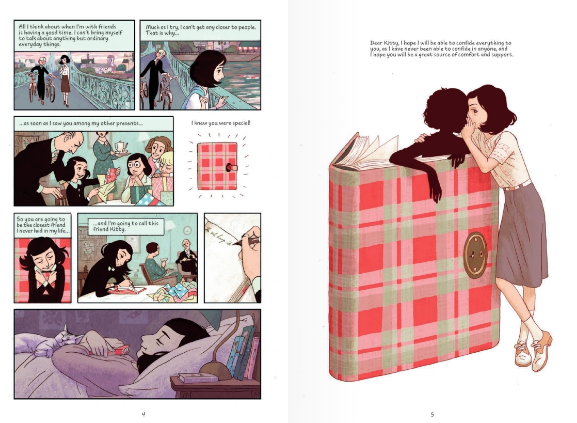 For her, the graphic novel adaptation of Anne Frank's Diary will introduce her to this amazing voice and incredible writer while building a bank of images that will deepen her understanding. I plan to give her the original diary (when I buy it - it was not on the shelves when I arrived and I never expected I'd have a student who wanted to read it!) but the graphic novel (for it's faults and the challenges of choosing which text to include, what to condense and what to leave out) will give her a powerful initial understanding of how cramped the quarters of the annex actually were, how tenuous their every day existence was and how the mix of personalities clashed. And, hopefully, even though she is just ten, my student will recognize what a gifted, talented, insightful writer Anne was, and at such a young age. 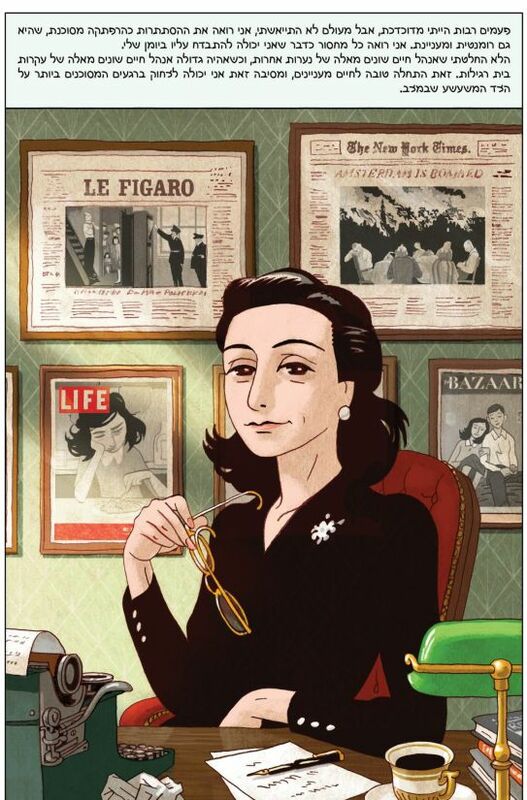 Revisiting the diary, which I haven't read since I was a teenager (I did buy the definitive edition about ten years ago, wanting to know what I missed) I was struck once again by the voice of the writer, the wisdom and introspection she was capable of. And, upon rereading as an adult, I think I was able to approach all the inhabitants of the Annex with more understanding and compassion, whereas, as a teenager reading it I was so ready to hate Mrs. van Daan and think badly of Anne's mother. As a young person reading Anne's diary, I only knew what Anne chose to tell me. As a person in hiding, the Annex was, for the most part, her entire world. 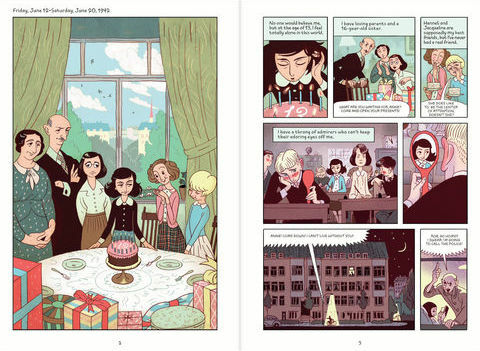 As an adult, I brought a better understanding of the history and events of the time to this reading, but also also appreciated the many illustrations that brought the events of the world outside the Annex into the story. Most of all, I think that with this reading, I was able to understand much better the isolation that the inhabitants of the Annex felt. As a child, my capacity to understand what it meant to never leave the Annex and empathize with this necessary imprisonment was limited. Maybe it was this visual telling of the story combined with the life experience I have had since first reading Anne's diary, but the monotony and miserableness of life struck me harder, as did the constant danger. I look forward to talking to my student after she reads this adaptation and see what leaves an impression on her! -There is a passage, taken in entirety from the diary (there are a handful of pages like this, where there are paragraphs of text and small illustrations) where Anne, wondering if Peter knows "what girls look like down there," thoughtfully describes her anatomy. 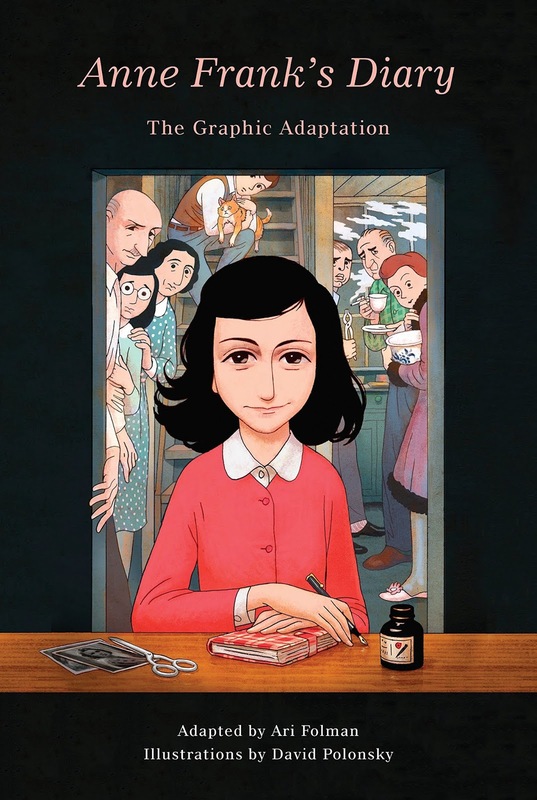 The full page illustration shows Anne, acting as the teacher in a classroom, Peter, the student at a desk. Projected onto the wall is a black and white image, concentric ovals that suggest a woman's anatomy.